Yesterday, I met Norbert. Norbert is in his mid-thirties and spends his day in the corner of a cot in a room at the Topház Speciális Otthon in Göd, about a half-hour drive from Budapest. His world is the room he shares with Tony and Dani. Although I had a hard time believing it, Norbert is one of the luckier residents: he has not been forgotten. A few months ago, when the charity arm of the IHBC launched its Give a Little campaign, its aim was to get a bunch of volunteers together to spend a day somewhere, doing some much-needed work. Volunteerism is very much part of the Irish psyche of expectation. Evidence of community involvement and volunteer activity has been a key requirement on Irish CVs for decades. It’s very much part of our culture. Many ex-pats in Hungary find it difficult to get involved, to do something more concrete than forking over a few forints. So when Declan Hannigan, Chair of the Give a Little campaign, organised a day at the centre in Göd, he wasn’t short of volunteers. On Saturday morning, at 8.30 am, 33 adults and five children began a day that would not be quickly forgotten. 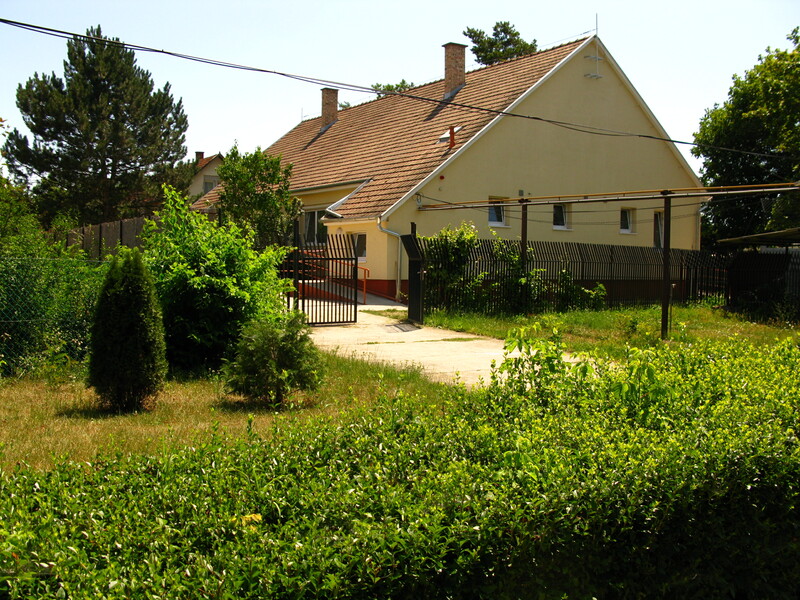 Our task: to paint one of the residential houses and to do some gardening. Throughout the morning as we set about organising ourselves to do what had to be done, many of us spoke of how it wasn’t nearly as bad as we’d been expecting. Mention ‘orphanage’ and immediately we flash back to TV images of old communist blocks in Romania and Bulgaria with patients living in horrendous conditions, supervised with military precision, made all the more stark for its complete lack of feeling. The bungalow we worked on was light and airy. It was a little disturbing to see the metal beds, each with a simple foam mattress, cotton cover, and a blanket, bolted to the floor. Wardrobes bore the names of the room’s occupants and few toys were visible. The common area was a combination of kitchen and living room, decorated with bright murals; the padlock on the fridge looked a little out of place, but as we would learn, life here works to a different set of rules and expectations. Overall, though, the impression was good. The collective sigh of relief was almost audible – this wasn’t nearly as harrowing as we had expected. Outside in the grounds, more volunteers cut grass and trimmed hedges. The football pitch is now usable again and the front garden no longer looks like an unruly meadow. It was hard work. It was hot work. But it was rewarding work. Most of us, in our 9-5 workdays, rarely get the same level of satisfaction as we got yesterday from seeing a job well done. We started, we worked, we finished – we made a difference. No amount of money could buy that sense of accomplishment. For me, scraping the glue from the wardrobe doors and making those doors look new again was the most satisfying work I’ve done in ages. As the international team of Irish, English, Scottish, Welsh, Hungarian, American, and Russian worked together, united in a common cause, we were fed by Jack Doyle’s, watered by Becketts, supplied with brushes from Kőházy Festékáruházak and paint from PoliFarbe. Although it’s a gated community, residents who can wander, wander freely. One chap had a fascination with smelling hair. Another simply wanted to name all the types of car parked out front. Daniel, the caretaker, had prepared us. We were the strangers; we were the ones out of place. So it was only to be expected that residents would be curious. Seeing such mental and physical disability up close and personal was harrowing. Those who wanted to, were taken in small groups to visit some of the wards. 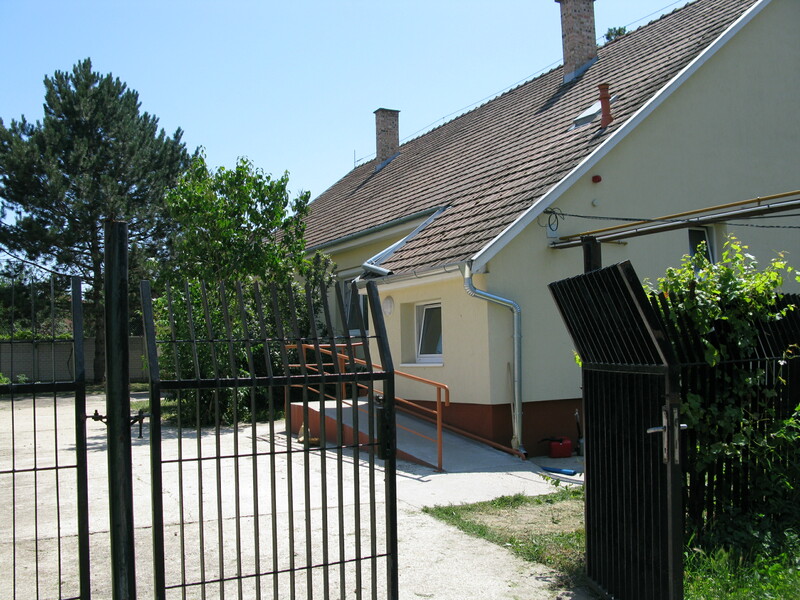 There are 220 residents from all over Hungary housed in Göd aged 2 to 45. They’re looked after by 140 staff, most of whom work 12-hour shifts, day on, day off. There are four main wings, long dark corridors lined with airy rooms decorated in bright colours. Rooms are decordated annually because the residents are not bound by societal rules of what you can and cannot do to a wall. Some pieces of plaster had been pulled away, kicked in, scribbled on. Toys hung from the ceiling so that residents couldn’t destroy them. Some don’t know their own strength. Televisions broadcast in every room and for many, that’s their view of the outside world. The first ward we visited had 45 residents, all of whom could move about, walking or in their wheelchairs. It’s staffed by four – a ratio of less than one carer for every ten residents. Not enough on so many levels. Anita, just shy of 18, wanted to shake hands and hug. I held her hand and found myself drawn into a tight hug. It was all I could do to hold it together. Anita is one of those who have been forgotten, left to the care of the state. She has never had a visitor. Her need, on whatever level, for physical contact was palpable. Alls sorts of emotions ran through me as we made our way up the ward. These residents all looked much younger than their years and I wondered briefly how much of that had to do with them not living in the ‘real world’ with all the stress and anxiety that this encompasses. They sat around, some on sofas, some in wheelchairs, some on the floor. Some were listless; others watched TV or each other. Some laughed, some made noises that might well have been laughter. Some did nothing at all, their bodies wasted, muscles atrophied, faces disfigured, but eyes bright and watchful showing that someone, a whole person, was home. Most were curious to know who we were. For them, we were a change in their routine. Something new. Something different. Later, in the Caledonia, over a pint or three, we would discuss whether that was what they needed – as well as painting or cutting grass, what if we spent time in the wards, just sitting, talking, and playing. What if we just visited? In the next ward, we met cot after cot with young children, five or six to a room, each lying quietly, limbs contorted. One child’s long, wasted legs conjured up images of famine-ridden Africa. Watchful eyes told us that they knew what was going on but just couldn’t communicate. One 4-year-old with encephalitis was being bottle fed. She has never had a visitor. Of the 40 residents in this ward, only 4 have regular visitors and even that might be an annual visit at Christmas. Ubiquitous Disney characters line the walls of the corridor. Soft toys look down on the kids from a height. The flickering TV screens provide noise and distraction. I hung back as the others went to say hi and make friends. All appeared visibly shaken. I was barely holding it together. Again I asked if we were intruding and again I was assured that this break in routine for the staff and for the residents was most welcome. And then I saw Norbert. Norbert is a grown man in the bed of a child. Kneeling in corner of his cot, he looked over the bars out onto his world. I stared. I couldn’t help it. He looked at me quizzically. The look he gave me wasn’t accusatory or defiant. It was neither helpless nor hopeful. I wanted to go over to him, to hold his hand, to talk to him. But I couldn’t. All my world experience garnered from years of education, work, travel, and relationships deserted me. I didn’t know what to do. I swear he could feel it. His world is the room he shares with Tony and Dani. He probably has a better understanding of his life than I have of mine. His look said it all – don’t be sad: don’t pity me, but don’t forget me. There are homes like this all over the world. The waiting lists are long. The disabilities are severe. The staff undervalued. While I might wonder how parents could give up their children and forget about them, I cannot judge. I don’t know their circumstances. I don’t know if I could cope, were I in their shoes. The staff who work at Topház Speciális Otthon are saints. They care. The residents seem happy. It’s a commmunity. 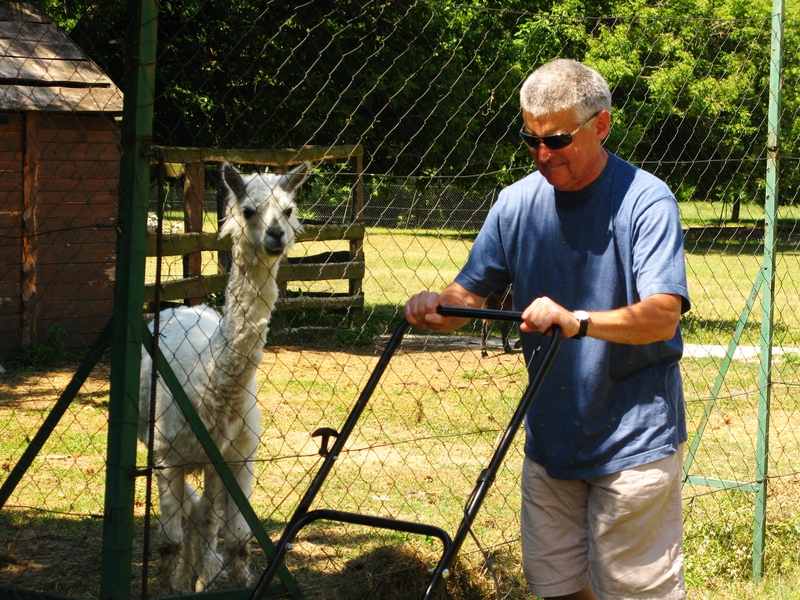 Daniel, the caretaker, had a word for all he met on our travels. It’s underststaffed, underfunded, and over subscribed. Their wish list: CD players, TVs, adult beds, a hoist to lift the adults into their baths, material for the romper suits that need to be specially made, bed linens, mattresses, blankets, diapers… more money, more staff, more equipment. I doubt that any one of us there yesterday came away unchanged. This was no TV commercial or broadcast documentary. This was real. Norbert is real. No matter how small or insignificant our contribution in the grand scheme of things, it felt damn good to make a difference. For those of you Irish and old enough to remember the Gorta ads, in the words of the inimitable Bunny Carr: Give a little. It would help a lot. Mary – beautifully written, and brings back so many memories of the visit to the two wards together. As you say, we have been changed by the experience. I have the feeling that I went to help them, but but received far more than I gave. I was lying in bed this morning, Gerard, and every time I moved position, I would see one of those kids in the cots. Maybe next time I’ll be better able to cope. Definitely an experience. And definitely a next time. Thank you Mary for this great article. As I read this my lovely Hungarian partner is on her way back from Transylvania after spending week there working voluntarily in an orphanage, Those who come from the West tend to expect others to do this work for them after we donate a few pounds, Euros, dollars or a day of our time. We naively think we are the only ones who give or care or do charity work. I have been humbled in the last week as I heard tells of fleas and lice, painting and 18 hour days from a teacher who is works on a minimum of pay for ten months of the year and nothing in the summer. Tomorrow my little bit will be too wash her clothes, delouse her and search for any remaining fleas. Very little compared to someone who has given so much. As we party and enjoy this summer, and pat ourselves on the back we should remember all those who do this work all year round; and all those who give from all nationalities. Am not sure I’d agree with you, Tim, particularly about expectations from the West. Neither would I be as dismissive of donations of money or time. Everything has to start from somewhere. Saturday was a good beginning and from what I saw, expats are only too eager to help out and do what they’ve been used to doing at home. If anything, the culture of volunteerism isn’t as obvious here and it’s harder to find opportunities e.g. language barrier, cultural barriers. And yes, of course, many many people work full-time for next to nothing the world over – and hats off to them for that. No-one is taking that away from them or denying the value of what they do. As for patting ourselves on the back – no-one returned to Budapest unchanged. We received far more than we gave and were humbled by the experience. Great article Mary, it really gives a sense of yesterday and the feeling of meeting those poor kids and adults, who, nonetheless were very happy to see us. 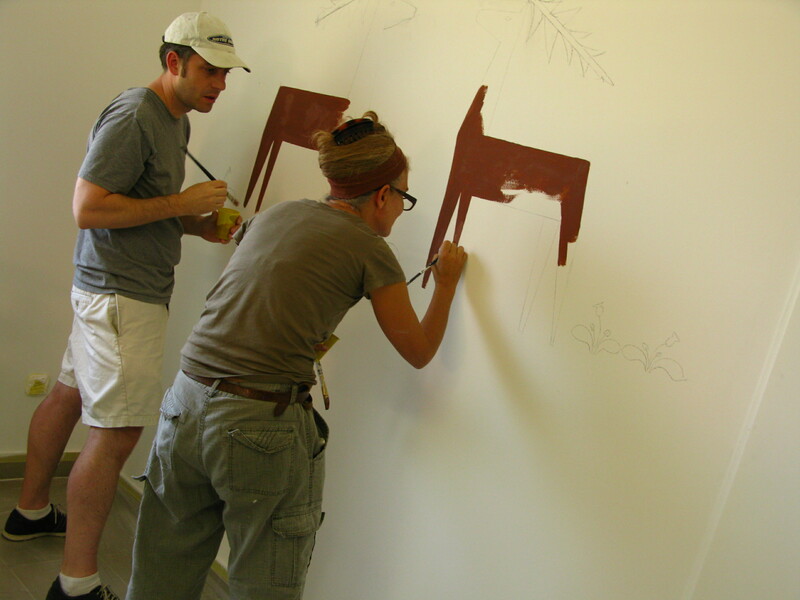 Some other helpers we should mention are Poli-Farbe, who supplied paint, Bellovits Gabor who provided free transport and Anna Banka who did a great job of rustling up support. This made my heart break, and Steve said it brought tears to his eyes, we have these kinds of places in every part of the world, in right here in the USA where everyone thinks the streets are gold, thanks for reminding us that it is time to do more to help others. Sometimes I think it takes a reminder that there is more to do to help than just cleaning trails or fighting for a few rights. Once again you have put inot words what we all needed to hear. What I discovered is that volunteerism is not so shouted about in Hungary as it is in the West but contrary to the suggestion it widely exists. People tend to give time rather than money. They don’t earn so much and so they can not give in terms of cash or materials. They don’t hold give away charity events and generally don’t get any publicity for what they do. Good works seem to be done at a more grass roots level. Maybe that is part of the desire to avoid cash lining the pockets of the unworthy. I have certainly been humbled by my little experience. It is also easy to give this way if you really want to. The IHBC did so in a marvellous way and I take my hat off to all those who gave of their time and hearts. The message I got was that what they need more than anything is organisation and willing hands. Mary a smile, a hug, gardening, painting and repair work does not have any cultural or language barrier. Bunny Carr wasn’t he yourman that did a runner with the charity money? He disappeared off rte over night without any explanation and this rumor came out. Supposedly Tom – that’s the rumour. Doesn’t take from the fact that it’s still a good line though! He had that afternoon chat show, too. With Anna McGoldrick. Man, that’s going back a few years! Mary he will be on rte tomorrow Thursday night at 7pm a little bit tv is the name of the program. I saw a clip of it during the week. Bunny is after getting very old you would barely recognize him.